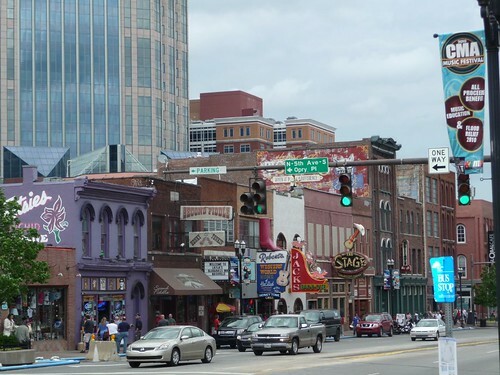 Mali Mish – Day 97: Nashville, Tennessee. We drove into downtown Nashville and surprisingly found a great parking spot right next to the area we wanted to visit. As soon as we stepped out of the car, music surrounded us. And Ava surrounded the downtown statues. 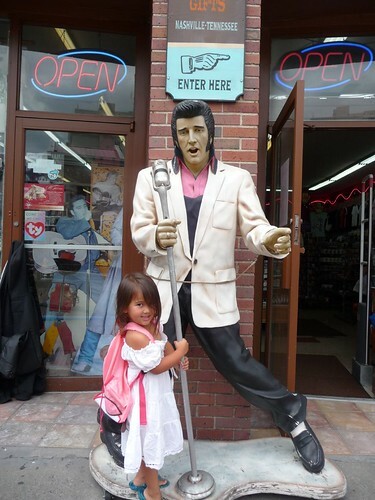 She has no real idea who Elvis is. Only that her Nona is a huge fan. But don’t worry, I foresee a field trip to Graceland in the near future. Our first stop of the day was to fill our bellies. Surprised? I didn’t think so. 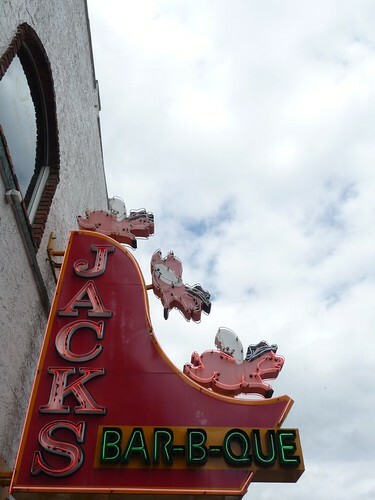 Today’s choice of the day was Jack’s Bar-B-Que in downtown Nashville. Going into a restaurant while starving is a bad idea. What’s even worse is having Dan order on a super empty stomach. Look what he ordered for us. 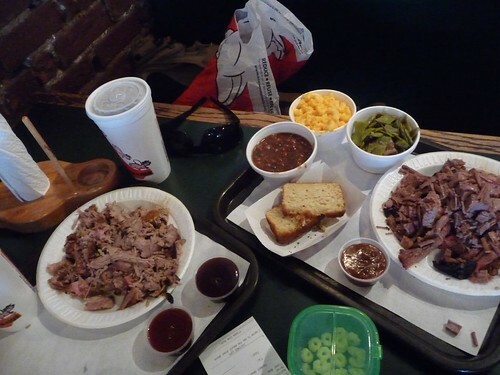 Four sides and two pounds to meat. TWO POUNDS. And of course we finished every last bit of this delicious goodness. We have the bellies to prove it. Next, we hopped into our time-machine and ended up in ancient Greece. 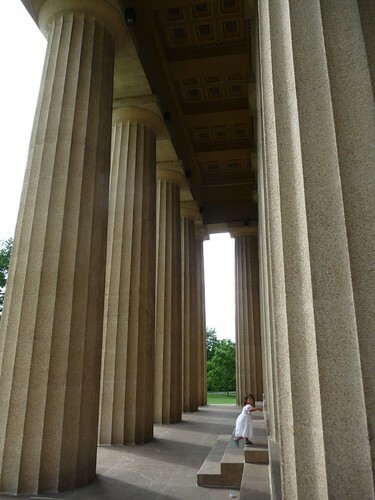 Hello there Parthenon! Just kidding. We don’t have a time-machine, much to Dan’s dismay. 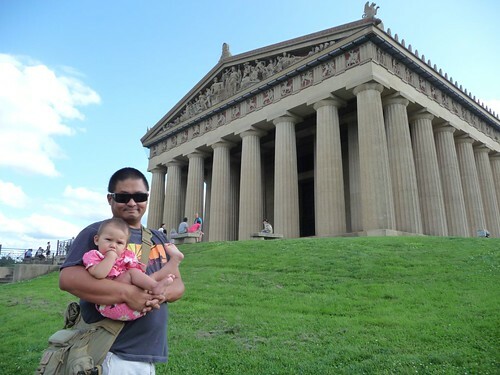 Nashville actually has a full-scale replica of the Parthenon as it would have looked in all it’s glory in Centennial Park. They actually built a temporary replica for the 1897 Fair. 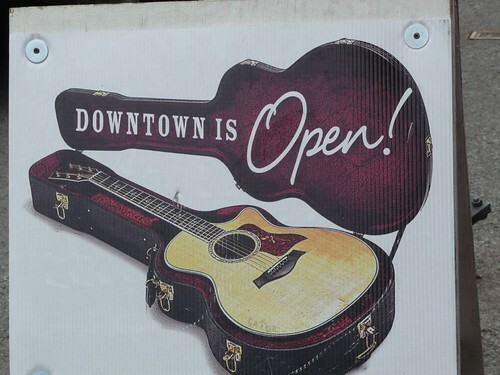 It turned out to be such a hit that they rebuilt it in concrete and dubbed itself ‘Athens of the South’. 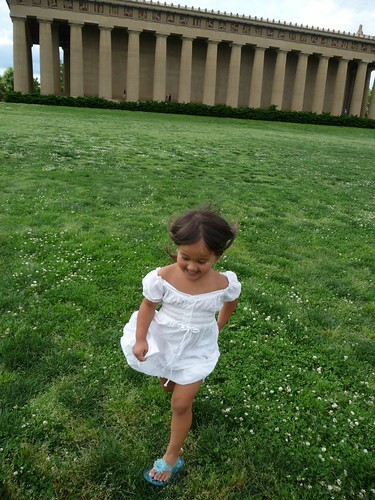 Taking your toddler there is really cool… for a split second. She kept asking if giants live here. Ava then had a much better idea. We didn’t know what to do with ourselves next. The Opry was closed due to flooding so we just headed back to the campground. As we drove off of the freeway, we noticed this little gem. Cooter’s!! Dan didn’t watch Dukes of Hazzard growing up (foreigner!) but I sure did. This place is a (free) museum and store. 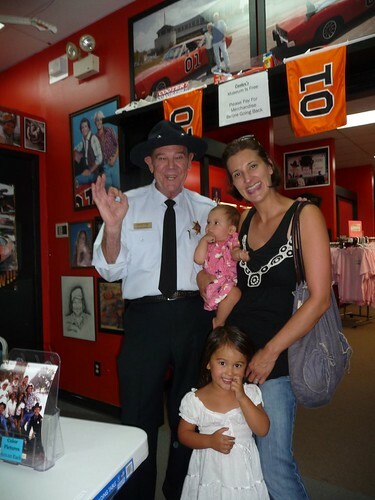 They had four General Lees, Daisy’s Jeep, Boss Hogg’s car, Cooter’s tow-truck and all kinds of crazy memorabilia. As we walked into Cooter’s, we walked right into a Hazzard County celebrity. That’s right. Cletus Hogg!!!! Yup, I was a little excited. And Ava? She likes policemen because they take bad boys to jail. 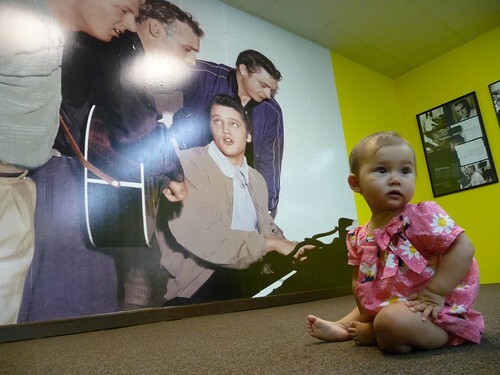 At the back of the museum, they had a bright yellow room dedicated to the famous Sun Records. We actually spent most of our time in this tiny room. Ava danced on the stage, Mila crawled around, and Dan and I watched a super good documentary about all these fellows on the wall. 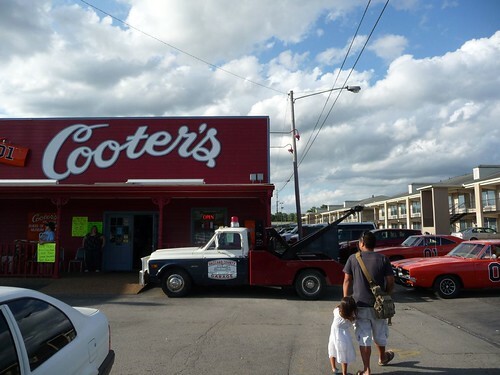 Right next door to Cooter’s is the “World Famous” Nashville Palace. This is where many country stars have performed or visited over the years and the starting point of Randy Travis and Alan Jackson’s careers. 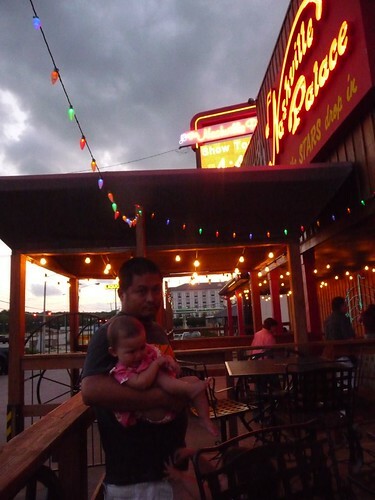 It was such a nice night that we sat outside, ordered some food and drinks and enjoyed the beautiful Nashville night. The entire place is tagged up with names of those who have visited and we were no different. Today was one of the most memorable days on our trip so far. Not only because Nashville is an awesome city but also because Ava was on fire. 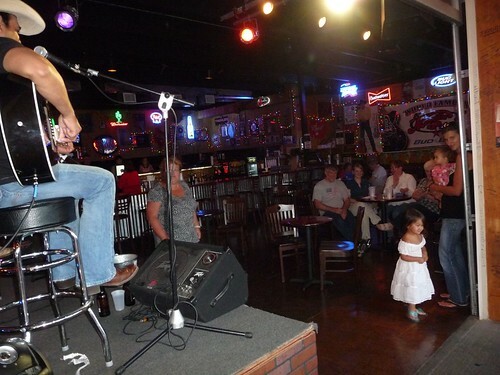 She danced her heart out in front of the band the entire time we were there. The singer had a hard time holding it together while Ava was dancing. I have NO IDEA from where she got these dance moves. I SWEAR. The only things she watches are Disney movies so I guess I am pointing my finger at you Cinderella. Afterwards, I asked her where she learned all those dance moves. She just shurgged her shoulders and told me it was a magic dress. LOL. One Response to Day 97: Nashville, Tennessee. She is too cute!! Love her hand on her hip!